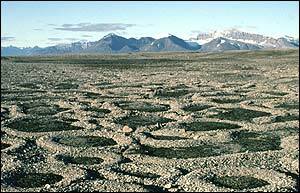 Researchers may have an explanation for the natural near-perfect circles of stones that cover the ground in parts of Alaska and the Norwegian island of Spitsbergen. Elsewhere in the far north, stones also form mysterious striking patterns on the ground. According to scientists, the circles are not the result of ancient art but due to cyclic freezing and thawing of the ground that drives a simple feedback mechanism that generates the patterns. "The patterns form by self-organization, and the same fundamental processes are at work in the formation of all these different patterns," says Mark Kessler of the Earth Sciences Department at the University of California, Santa Cruz, US. Scientists had proposed various processes to explain the unusual patterns of stones and soil. But until now, no explanation was able to account for them. Writing in the journal Science, Kessler describes a model of the processes involved in the self-organisation of these patterns, known to geologists as "sorted patterned ground". "The model I developed is essentially a hypothesis about what is important in the formation of patterned ground," Kessler said. "When you run the model on a computer, you can see the evolution of the pattern over time, and you can also see how small changes in key parameters result in a transition from one pattern to another." According to Kessler, the patterns result from the interplay of two mechanisms: lateral sorting, which moves soil towards areas of high soil concentration and stones toward areas of high stone concentration; and squeezing of stone domains, which causes stones to move within linear piles of stones and lengthens these lines of stones. The relative strengths of lateral sorting and squeezing, plus the slope of the ground and the ratio of stones to soil, were the factors that determined which pattern would emerge, Kessler said. The driving force behind the patterns is the process called frost heave - the expansion of fine-grained soils during the freezing of wet ground. "If you start with a random layer of stones over a layer of soil, frost heave makes the soil layer unstable and deforms the interface between stones and soil," Kessler explained. "One of the real mysteries to me was how you can get labyrinths or islands of stones in one location and polygons in another, when the ratio of stones to soil is the same in both places." Mark Kessler: "These landscapes are so amazing"
Our model indicates that you get polygons when the squeezing is strong enough to counteract the effects of lateral sorting." The researchers compared the patterns generated by the model with those observed in nature, using low-elevation aerial photographs of polygon networks in Alaska. One reason these patterns have remained unexplained for so long may be their occurrence in remote areas, far from the temperate zone where most scientists live. "If these patterns were on the ground around here, I think we would have figured them out a long time ago. These landscapes are so amazing, it's the kind of thing that really calls out for an explanation," Kessler said.